This post explains how to let Hudson automatically run your unit tests / rspec tests upon pushing code to your git repository. If you browse to localhost:7080/hudson you’ll be greeted by the user interface of Hudson. I’ve explicitly set the port to 7080 because the default port (8080) was already used by tomcat in my case. Now we’ll add some plugins. In Hudson’s user interface click on “manage Hudson” and click on “add plugins”. Install the following plugins: git, ruby, ruby metrics, rake. Click on “restart Hudson when no jobs are running” after the plugins are installed. We’ll use rake for defining our test tasks. Make a rake file (named Rakefile) in your project root folder. desc "do rspec tests and test coverage"
The GEM_HOME=… part is only necessary if you install your gems locally in you project folder instead of system-wide. In the first job we call the take task ci:setup:testunit which is defined in the ci_reporter gem. This gem will create Hudson-compatible reports out of the reports generated by test unit or rspec. Next we call the rake test task which will actually run the unit tests. We also pass a variable CI_REPORTS which tells ci_reporter where to create the reports. The second job first runs the ci:setup:rspec task which again prepares ci_reporter. 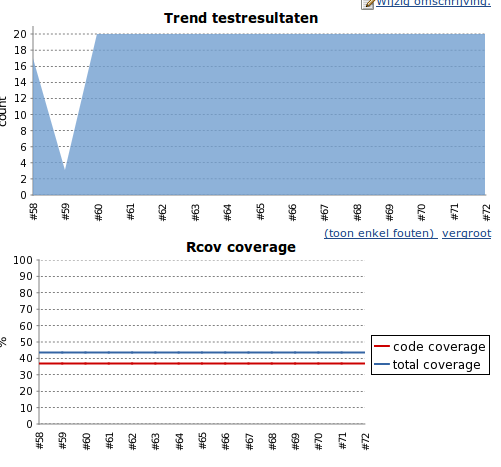 Then we call spec:rcov which will run the rspec tests and create the coverage reports. Note the SPEC_OPTS variable in which we tell rspec to create an html report (which will be converted to xml files by ci_reporter). Now check the post build actions “publish JUnit reports” and “publish coverage reports”, save the Hudson project and build it! Et voila! You now have a butler running your tests and creating nice reports as soon as you commit code to your repository! I experimented a bit with Continuous Integration a while ago. I found some great freely available tools which facilitate the automatic building and testing of (web) applications. In this post I’ll discuss the setup of a system that uses Hudson to automate the build and testing process. I intend to write some follow up posts that digg further into testing a web application using Selenium. In this post I assume you have already set up a Maven project, and that you use Subversion as version control system (check out my other post if you are unsure about this).